Vaccine research and development is a necessary project especially in Egypt. Today aound 15-20% of the population are infected with Hepitites. It does not make sense that Egypt imports these vaccines or has promising research for a cure while having this high percentage of infected people. There is great opportunity here to become one of the top producers of vaccines. Not only vaccines for human consumption but also for animal and poultry, Egypt has a high consumption of these types of vaccines. We need to benchmark. Where are we in this field. Round up all the producers of vaccines in egypt and provide them with the necessary guidance, monetary and tax incentives and political support. 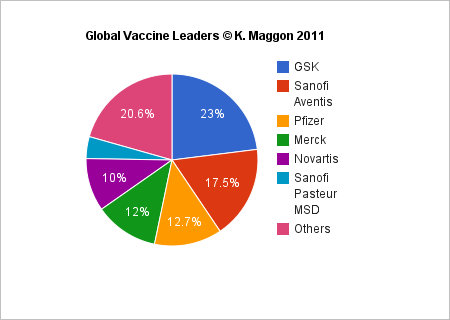 The following diagram shows the global vaccine leaders. Global Vaccine Market Review 2008 (World Top Ten Vaccines) World Leading Companies & Top Selling Vaccines 2008 The global vaccines sales in 2008 were $24 billion as compared to $18.5 billion in 2007. Prevnar was the top selling vaccine brand with sales of $ 2.7 billion followed by Gardasil at $ 2.3 billion. GSK Hepatitis and Infantrix/Pediatrix Vaccines and Sanofi Aventis Pasteur Fluzone Influenza Vaccine each with sales of $ 1.2 billion were the joint 3rd top vaccines by sales. The polio vaccine IPOL from Sanofi Aventis Pasteur was the sixth vaccine to have sales of $ 1 billion in 2008. Merck, GSK, Sanofi Aventis, Wyeth and Novartis were the top five vaccine companies. More vaccines like RotaTeq, Rotarix and Cervarix are likely to reach sales of $ 1 billion in the next two years. This knol has been cited in peer reviewed biomedical articles. Egypt’s spiralling threat of hepatitis C virus – already the highest incidence rate in the world -- is alarming researchers who fear a potential epidemic of the blood-borne disease could spread across the most populous Arab country. The findings of a recent study published in the National Academy of Sciences showed that more than 500,000 new HCV infection cases occur in Egypt every year. Much of the problem behind the soaring infectious rates is poor healthcare oversight and erratic medical hygiene. "Nearly seven out of every 1,000 Egyptians acquire HCV infections every year. This is the highest level of HCV transmission ever recorded at a national level for a disease transmitted by use of non-sterile medical instruments," says Dr. F. DeWolfe Miller, lead author of the study. Prevalence of hepatitis C in Egypt dates back to the 1970s. It was then that health authorities in the Nile Delta and Upper Egypt were injecting patients with tartar emetic to stop the spread of the water-borne disease known as Bilharzia. But many of the needles were unsterilized, causing HCV to spread to thousands of Egyptians. Nowadays, many blame the government for not halting the virus' proliferation throughout the country of about 80 million people. The Egyptian National Committee on Viral Hepatitis states that 9.8% of Egyptians are HCV infected, whereas doctors and researchers claim that the real figure is between 15% and 20%. "Most virus C patients come from Egypt's most rural and poorest areas and they rely on the medical insurance programs,” said Dr. Lotfi Wanees, an expert on hepatitis. “Medication cost for every hepatitis C patient stands at an average of 70,000 Pounds [$12,250] and the government has failed to provide this sum for most of the patients." He added: "There are also the deals signed between the Ministry of Health and medicine companies. Many virus C medicines produced by Egyptian pharmaceutical firms are not verified in the West and proved to be inefficient. But they are still being prescribed to patients and the government pays millions of pounds to purchase them." According to Wanees, the "community acquired" virus has also been accompanied by culture and literacy problems, as many of the poor, uninsured patients resort to superstitious and primitive medical substitutes, which worsen their cases. Complications of hepatitis C lead to liver cirrhosis or liver failure. Many people infected with the virus have no symptoms and are only diagnosed when liver damage appears many years later.